What good is a Bicycle Oufit without the Bicycle to match? I’m in love with this bicycle! As I mentioned in the Samantha’s Bicycle Outfit review, I don’t collect for Samantha, but as soon as I saw this bike, I knew my small friends needed it. I’m trying not very hard to limit the number of large items in our collection, as space is limited, but every girl needs a bike, right? I think the design is versatile enough for a modern or historical doll collection. The detailing is beautiful, the materials are top notch. The frame is metal, as is the chain guard, the axles, and the pedal assemblies. The basket is plastic, but it’s not molded, it’s actually woven like a wicker basket, just not with wicker. I prefer the plastic, as all of my real wicker baskets tend to start breaking apart over time. 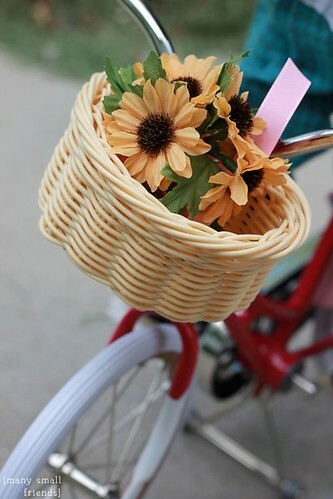 The flowers are removable, as is the basket itself. 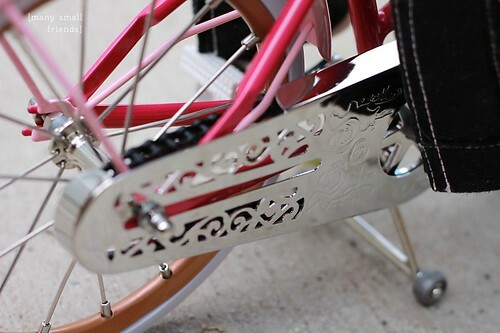 The chain is also a flexible plastic, and is a decorative element that does not move when the pedals are pushed. The tires feel like firm vinyl, the seat is flexible vinyl with “leather” texture, and the handle caps are plastic with a faux “wood grain”. I put together a 9 minute unboxing and review video, if you prefer to study the bike in three dimensions. I think the scale on the Bicycle is just right and it fits our American Girls marvelously. I imagine it would work well for any 18 inch doll. My only complaint is that the stand (located between the wheels) doesn’t fold back for more realistic bicycle play. You can roll the bike forward, but only either the front wheel or the back wheel makes contact with the ground and spins. Fortunately the stand has small wheels, so you’re not scraping the bike across the floor. The stand does work very effectively to stabilize the bicycle, even with a heavy doll seated upon it. Overall, I am very pleased to add Samantha’s Bicycle to our collection. It’s an heirloom quality piece. I imagine it will be atop the Christmas wish list for many young (and old.. ha ha) girls this holiday season. 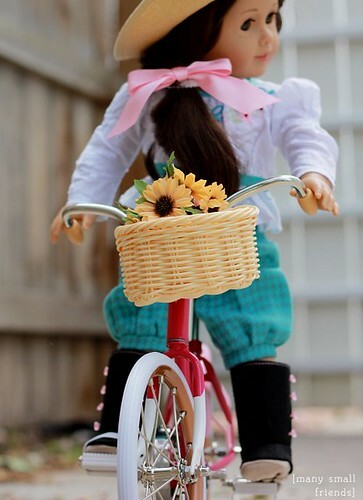 Do your dolls have a bicycle? What do you think of American Girl’s Beforever version? This entry was posted in Doll Review, Doll Video and tagged 18" Dolls, American Girl Dolls, Beforever, Doll Review, Doll Video. What doll was used to model in the video review/photos of Samantha’s bike? She is one of the Truly Me (previously My American Girl, previously Just Like You.. lol) dolls.. #55!